An out and back walk from Horton in Ribblesdale, following the Yorkshire Three Peaks route up and down to Ingleborough summit. The walk heads over the Settle to Carlisle railway line and then on to Sulber Nick. From there the path climbs steadily across Simon Fell, before climbing more steeply up on to the plateau top of Ingleborough, affording panoramic views all along the way. The return is via the same path. Parking: Public car park in the centre of Horton-in-Ribblesdale (grid reference SD 807 726). This route follows the final leg of the Three Peaks Route in reverse, and then returns back down the same path from the summit. Leave the car park in the centre of Horton by the metalled path at the toilet end of the car park, and proceed a few yards further over the wooden footbridge. Over the footbridge, turn left and continue along the pavement by the road heading for the train station. Just in front of the station, where the road bends around to the right, branch left up the short steep road to the station following the footpath sign for "Crummack Dale 2 miles". At the top of the slope, pass through the wooden gate ahead, just to the left of an ornate lamppost, to enter onto the platform. Cross over the two train tracks with care, following the signed instructions. Once over the track, veer slightly to the left of the end of the wall ahead, and climb up the few steps to pass out through a wooden kissing gate into a field. Follow the path heading up hill directly away from the wall. After about forty yards, pass through a gate in the wall, and continue onwards in the same direction away from the wall. The path is very well worn and easy to follow, heading initially in the direction of Simon Fell and Lord's Seat visible on the horizon. Over to the left is Horton Quarry, which is continually changing the landscape whilst excavating the limestone. Behind now there is an excellent view back over to Pen-y-ghent, towering over Horton in the foreground. Continue along the path, which after a few hundred yards drops down and crosses a farm track, before rising again to pass over a wooden stile in the wall a further thirty yards on. The path continues for a further four hundred yards before reaching another stile. Just over the stile there is a plaque giving information about Ingleborough and the landscape in this area. The path climbs from here for about twenty yards and then bends around to the right. This short section up through the initial limestone pavement is marked on the map as a path, and not as a footpath. The path now follows a series of wooden eighteen-inch high way marks, with a green band around the top of them. The path continues towards a wall, before bending around to the left to head away from it where a yellow arrow points uphill on the way mark. The path then meanders through the limestone following these wooden way marks. The path becomes grassy underfoot for a short section, before returning to limestone where a few yards further on the path passes through a gap in the wall. The path continues away from the wall up hill for about eighty yards, where it reaches a wooden signpost. The signpost shows back to Horton, to the left is Austwick, and straight on to Ingleborough. Continue ahead heading up the hill following the Ingleborough sign to a cairn a further forty yards on, and then on to a double wooden stile over the wall ahead. Pass over the stile, and continue ahead along the very well defined (and in some places very eroded) path through Sulber Nick. As the path begins to flatten, the path ahead can now be seen extending for just over half a mile ahead. The path passes through Sulber and continues along its straight line towards Ingleborough becoming, after a while, grassy underfoot. After about three quarters of a mile from the previous stile, a further signpost is reached. Before this signpost is reached, in the distance the path to be followed can be seen climbing the lower slopes of Simon Fell. 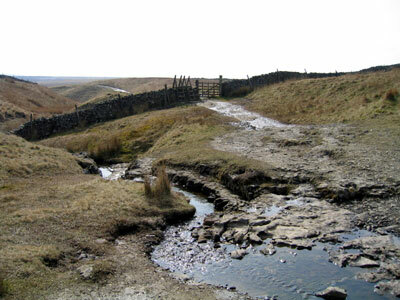 The sign indicates that to the left is a bridleway to Clapham 2¾ miles, Selside to the right 1¾ miles, Horton is back in the direction the path has come from 1½ miles and Ingleborough straight on up the hill 2¾ miles. Follow the sign for Ingleborough heading up the hill past more limestone outcrops and then around to the right of a small knoll. The path then continues to climb slowly towards Ingleborough before pulling in by a wall to pass over a wooden stile. Once over the stile, pass between the limestone pavement on the left and the wall on the right for about one hundred yards, before the path becomes grassy again underfoot. The limestone pavement exhibits excellent examples of the clints and grikes formed by the limestone. The clints are the limestone blocks, and the grikes the water eroded spaces between. The path then follows quite closely to the wall for a further four hundred yards before arriving at a double stile. Where the wall bends around to the right before reaching this stile, on the other side of the wall is Nick Pot. The path on the far stile is again very obvious, and quickly crosses a small stream which a few yards further on forms a small waterfall. Continue now along this path passing by an old derelict shooting hut, before passing over a few wooden boards over one of the boggier sections, before starting to climb more steeply. The path continues to climb for a further third of a mile before reaching a stile in a wall. Pass over this stile and continue ahead along Simon Fell Breast for about three quarters of a mile. Whilst walking along this, there are excellent views across towards Little Ingleborough and up on to Ingleborough itself. After about three quarters of a mile, the path then starts to climb much more steeply, before briefly flattening by a very small tarn. It then climbs steeply again to the right of a large scree patch for the few yards up to meet a cobbled path, which is the route up from the Old Hill Inn at Chapel-le-Dale. Upon reaching this path, turn left continuing the climb, which soon after reverts to man made steps rather than the cobblestones. The path passes to the right of a small rocky outcrop and enters onto the top plateau of the hill by a large cairn. Assuming good visibility, the shelter on top should now be visible a few hundred yards ahead. If it is misty keep careful note of your direction of travel, as there are many paths down from the top of Ingleborough. The path skirts round the right-hand side of a rocky outcrop about two metres in height and then heads on in the same direction across the flat plateau about four hundred yards to the trig point at the top. From here there is an excellent panoramic view of Whernside, Pen-y-ghent, Pendle Hill (with a distinctive nose shape) out into Morecambe Bay and the Lakeland hills. About thirty yards past the shelter is the triangulation point marking the summit. Upon starting the descent, return to the shelter and then head back for the line of cairns near the edge of the hill, heading back in the same direction as you came from. Just before one of the cairns there is a small loose rock shelter which has been built and a further thirty yards on there is another large cairn. Immediately after this cairn start to descend along the path which passes back along the left hand side of the small cliff face. The path then drops down the man made steps before recommencing its descent down the cobbles. Part way down these cobbles, as the path bends around to the left, another path branches off to the right in front of a cairn. Take this path and drop down past the small tarn and continue now back along the path used on the way up to return back down the four miles to the car park in Horton.